The ex-England boss says he has no interest in returning to management right now, however. 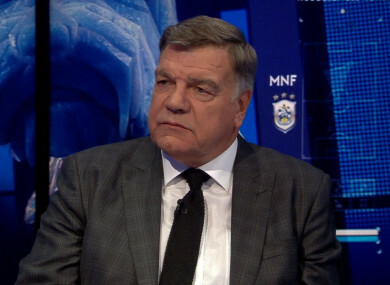 Allardyce was on Monday Night Football. SAM ALLARDYCE HAS no interest in returning to Crystal Palace to replace the sacked Frank de Boer. De Boer was shown the door by Palace today, having lost each of his four games in charge, with Palace failing to score. The Dutchman spent 77 days at Selhurst Park after replacing Allardyce, who kept the Eagles in the top flight last term after taking over with the club under threat of the drop. Former England manager Allardyce revealed that he had been in contact with Palace chairman Steve Parish had made contact after De Boer’s departure, but not to negotiate a return to his old job. “Just to make it clear for everybody and to stop the speculation, I spoke to Steve just before I got here and said that, for me, I wouldn’t be ready to come back,” he told Sky Sports. “I’ve made a decision and I wouldn’t feel comfortable taking any position as a football manager as I’m enjoying my life at the moment, watching everyone else [dealing] with the pressures of the Premier League. Roy Hodgson has widely been tipped as De Boer’s most likely successor at Palace — his last role being the England job, before leaving after Euro 2016, leading to Allardyce’s appointment. Email “Big Sam contacted by Crystal Palace chairman after De Boer sacking”. Feedback on “Big Sam contacted by Crystal Palace chairman after De Boer sacking”.